Life is beautiful, for one who understands its value and gives it what it assuredly deserves. Love is the major wheel on which our life is being driven. Without affection, everything seems futile and worthless. However, we need somebody to express our affinity to and that somebody is our partner. When you're crazy in love, any place with your lover by your side may seem mesmerising. It would definitely be heavenly to be away from the magnetic pull of work and your peers and to be all alone with the one you love, creating everlasting memories amidst the glistening sand and roaring ocean at Andaman. How about visiting Andaman this season and taking home the ceaseless beauty of your partner and the place? As long as you or your spouse is not hydrophobic, why not? Andaman is a group of peaceful little islands surrounded by the deep blue Indian Ocean, away from everything that could poke that stress button on your mind. From privacy to scenic beauty and adventure, Andaman has every possible charm that any place can possess to strengthen the new bond of love, affection and trust. Here are few places, for all new as well as old lovebirds, that you can visit to have a wonderful time and to capture timeless tales of love. Located at an approximate distance of 36 km from Port Blair, Neil Island has always been an option for peace loving tourists. This island is perfect for couples on account of its several romantic spots, such as Lakshmanpur Beach, Bharatpur Beach and other romantic restaurants. If you are looking to spend time with your partner away from noise, then Neil Island is your date. Little Andaman is the perfect island if you are looking to indulge in some water activities with your partner. Apart from serene beaches, waterfalls and rainforests, this island offers boating, surfing and elephant safaris. Couples can savour their exciting moments in midst of these natural wonders full of surprises at every step. Explore this marvellous piece with your partner and be astonished by the enthralling diversity of the island. One of the least-explored island of Andaman, Long Island is definitely a romantic getaway and a sure-shot picnic spot. You can have your partner by your side all the day at Marga Bay or Lalaji Bay and explore the natural charm of the island. The whistling of winds, roaring of waves and rustling of leaves, everything in turn makes the surrounding look surreal. Get immersed in the air of romance all around and create the best of your moments together. Long Island also offers fishing and boating. Mayabunder is an en route destination and hence, a stoppage point for every traveller. You can take a break with your partner at Mayabunder and taste some local delicious food. Located in the central part of Andaman and famous for its Karmatang Beach, it is a must-visit destination for every couple looking forward to spending some quality time with each other in a private and undisturbed surrounding. From boat rides to trekking through forests, Diglipur is an offbeat stoppage for every traveller who is in pursuit of extra beauty in an extraordinary frame. However, over a period of time, it has become popular for its natural beauty and the surroundings, which provide ultimate privacy to couples. You can afford some luxurious time with your partner at Ramnagar and Kalipur beaches. Being the largest town in northern Andaman, it is gaining popularity day by day for its unexplored places. How about exploring a few new places with your partner at Diglipur? 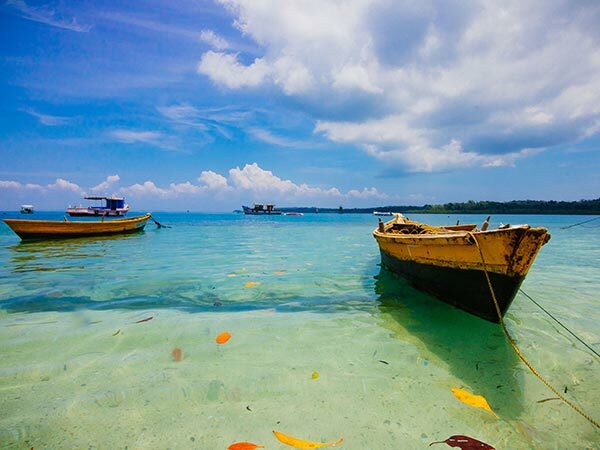 Undeniably, the list is incomplete without Havelock Island. Largest of them all and popular amongst each and every traveller, it is not possible to be in Andaman and not enjoy the liveliness of this island. Havelock Island is situated at an approximate distance of 41 km and if you want to mingle with the tourists and natives of this place, then Havelock is your place. Be with your partner and cherish the moments of being amidst exotic nature. From snorkelling at Radhanagar Beach to scuba diving at Elephant Beach, Havelock Island has everything that an adventurous couple would opt for. You can also plan a date with your partner at the romantic beach hotels.